I will find someone new. that you were using me. but i guess your plan was a flop. even if you only wanna compete. it was like throwing a big pointy dart. but I didn’t realize that I was a big fool. and we were never ever even. but now our friendship is dead. it says that you were my wrong choice. her relation with you is strong as an iron rod. nothing is more valuable then mother’s care. and the one who makes you smile. and adores you as her beautiful star. and stands by you when you face defeat. She is everything I ever wanna be. moments with her become special memories. For all the free people that still protest, You’re WELCOME. We protest you and we are protected by the best. but who will fight for you? No one standing in your crowd. wearing the boots and carrying guns. to make sure your future is carved in stone. Well!! at least we try. And we want no choice other than that. Take a look in the back of your brain. Wars must be fought and young men must die. We came here to fight for ones we hold dear. If that’s not respected, we would rather stay here. and pray for those behind enemy lines. Be thankful that we chose to go through hell. That you will never leave?????? Education is the basic tool for the development of consciousness and the reconstitution of society. It is a medium to enhance the idea of society. Society of upgradation and self development along with peace and harmony among the individuals. For a better world our first and foremost step is to eliminate the problems or reduce them with the help of government and on organisational basis. In our day to day lives we see many people who are concised in their own shell with only one goal of earning money and accommodating their family on financial terms. But some of them have forgotten the value of education and its influence on each and every aspect of life. Its rightly said, The entire value of society depends on what opportunities it provides for individual development. In 1947 i.e. after British Rule, literacy was of only 12%. In 2001, it has escalated to 64.84% and the latest census of 2011 shows literacy rate of 74.4%. Though it seems like a very great accomplishment but still the stats needs to be proliferated . This clearly exhibits that the dream of India to become a developed country starts right from there where people end up living a rustic livelihood. The perennial inspirations of bucolic areas have undoubtedly safeguarded the culture and traditions of India but now, the time has come to eradicate illiteracy and maintain the balance amongst individuals. Not being educated is just similar of being able to investigate statements and optimise their veracity. Sustainable development and education are linked to each other. Literacy is a key level of change and a practical tool of empowerment on each of the three main pillars of it. A) Economic Development B) Social Development C) Environmental Development Transformation of world for the betterment of individuals is the foundation for achieving improvement. Now, the choice arises with a question.. IS EDUCATION THE ULTIMATE REQUIREMENT OR PERSONAL PREFERENCE?? They are not doing for their own fame. They are ready for any fight. They are ready on their way. And another end…. 23rd February, 2019. It was a day the whole 9th and 10th grade were looking forward to. It was the day for the farewell. It was another end to memories and friendships. “The glamorous decorations, We put in all our efforts. All for a few moments, And D day was near.” The best part of the work we were doing was that most of us had been given the work we were passionate about. 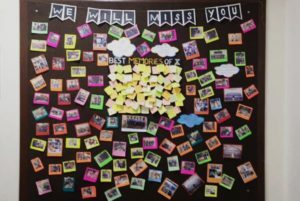 The most difficult part of giving a proper farewell to the 10th graders was that they were a lot more creative than us. So we had to work a lot to let the creativity in us flow to the best level. The committees had to unite for a lot of hours for the grandeur to be displayed on the day of the farewell. The end was well. But….most of us felt kind of bad because they were going. The batch which went was a batch of unity. A batch of friendship. A batch of fun. This time, the end was well but not all was well.